Update: Unfortunately, the Beach slot is no longer offered. You can find similar themed games on this page. 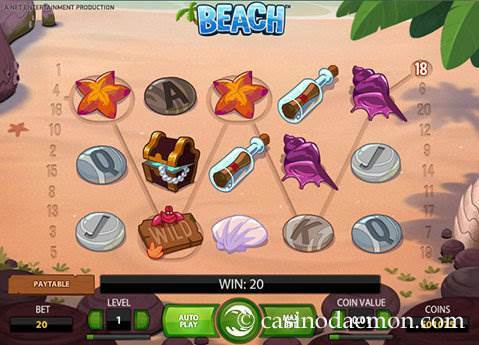 Beach is a cute summer slot from Net Entertainment that allows you to lounge at the beach and enjoy the sound of the waves while trying your luck for some wins. Although you won't be able to enjoy the warm summer breeze that this slot throws off in spirit, you can enjoy the game from the warm comfort of your home in cold winter days while thinking about the warmth of a real beach. 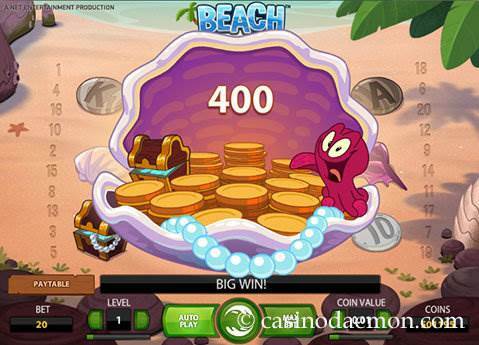 The cartoon-style symbols of the game show beach pebbles and items, as well as a cheeky octopus. The symbols are not on rolling reels like they are in other slots, instead, they are swept in with the waves. The special features of the slot include a crab wild, the octopus wild that can swap symbols around for better winning combinations and multiply them by 2, and you can trigger up to 24 free waves. The variance of the slot is medium, which means that you might get regular winning combinations, more often with smaller prizes rather than larger. Since the game has free spins and other special features we recommend playing it for a little while, at least until you managed to trigger the special features. The theoretical return to player is 96.8%, which is on the higher end of the slots. 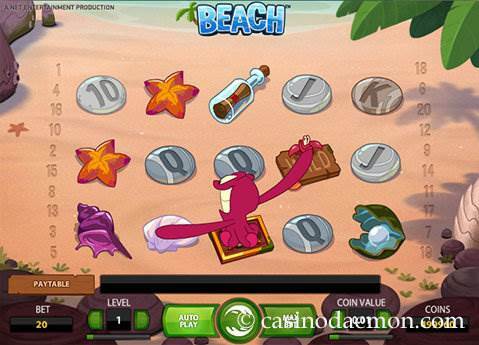 Unfortunately, Beach slot is not yet available for mobile devices, you can only play it on a desktop computer or other device that supports Flash. The game has a few interesting features that can really make it worthwhile. There is a special wild symbol that can stand in for other symbols for winning combinations, except the other two special symbols. The Octopus Wild is another special symbol that has the power to swap the positions of two symbols from the screen around to create a better winning combination, and it also stands in as a joker and doubles the payout of a combination. The octopus wild can only appear on the third reel. The message in a bottle is the scatter symbol and at least three of them anywhere trigger the free waves. You can get between 8 and 24 waves, depending on the number of triggering scatters, and they are essentially free spins for which you won't have to pay. 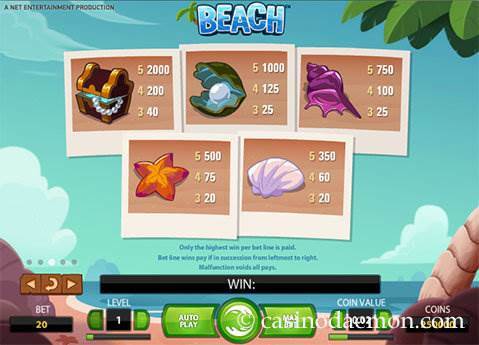 The Beach slot has 5 reels with 3 rows and 20 fixed pay-lines. You can play the game with coin values between 0.01 up to 1 £/$/€ and select to play up to 10 coins per line. The minimum bet in a round is 0.20 £/$/€ and the maximum is 200 £/$/€. You can also play with automatic options.